Thor & Loki: Blood Brothers retells the "Loki" mini series and subsequent graphic novel by Robert Rodi and Esad Ribic. Be forewarned that this dark and brooding tale doesn't contain a great deal of our golden haired thunder god, instead delving into the mind of his most dangerous foe, his brother Loki. 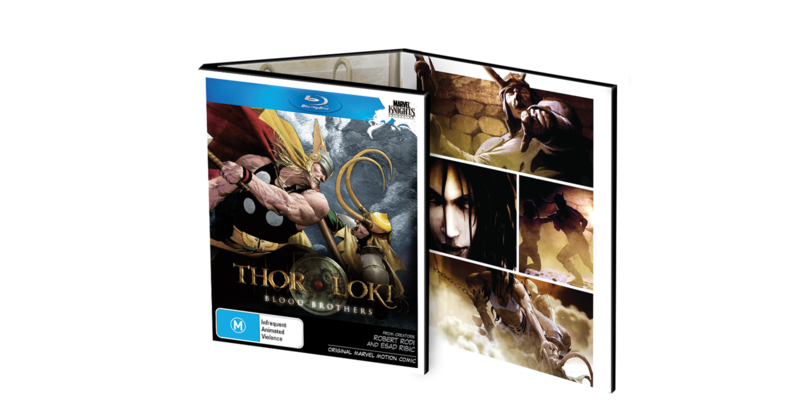 Initially released digitally in the USA on iTunes, the Playstation Network and XBox Live, this is the first time that we Aussies have the chance to see the 5th title in Marvel Animation's motion comic line. 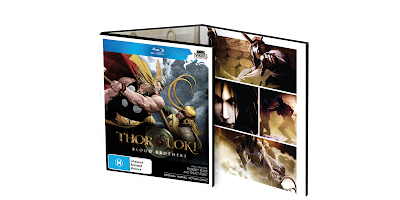 Released locally by the good people at Magna Home Entertainment, Thor & Loki: Blood Brothers is available now on BluRay and DVD. As stated previously, Loki is the main man in this story. Throughout the years he has been Thor's most dangerous and maniacal enemy. The genius of this idea is in making a God's most dangerous enemy his own brother. 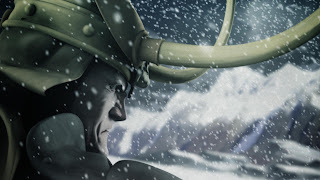 All but invincible, the god of thunder is most susceptible to the cunning of his emerald clad bretheren, Loki Laufeyson. Eternally at war, Loki manages to seize the throne of Asgard. Hi first order of business is to send his brother Thor to the executioner. This series manages to flesh out Loki's character as he develops from a cunning snake to a bloodthirsty dragon. Anyone that is familiar with Esad Ribic's artwork will know that he produces some beautifully rich and fantastical pieces. He perfectly delivers an old world, fantasy which at times is reminiscent of Arthur Rackham and George Grie. The artwork is of the best quality and complimented by Magna's excellent Blu Ray transfer. Although not traditional animation the motion comic can at times leave you fooled. The entire opening sequence appears to be a well rendered CG sequence. At times it is easy to forget that these are static images that have just been manipulated to make mouths move. The voice acting is spot on and flamboyantly Shakespearean. The first thing that hit me with this Blu Ray was the packaging. Somewhat of a triptych, it is presented in a gatefold, cardboard case with excerpts from Ribic's art and the original graphic novel on some highly detailed, matte stock. The print on the disc itself is very fine and striking. It takes alot to make a product stand out on the DVD shelves and Magna have absolutely nailed the mark. 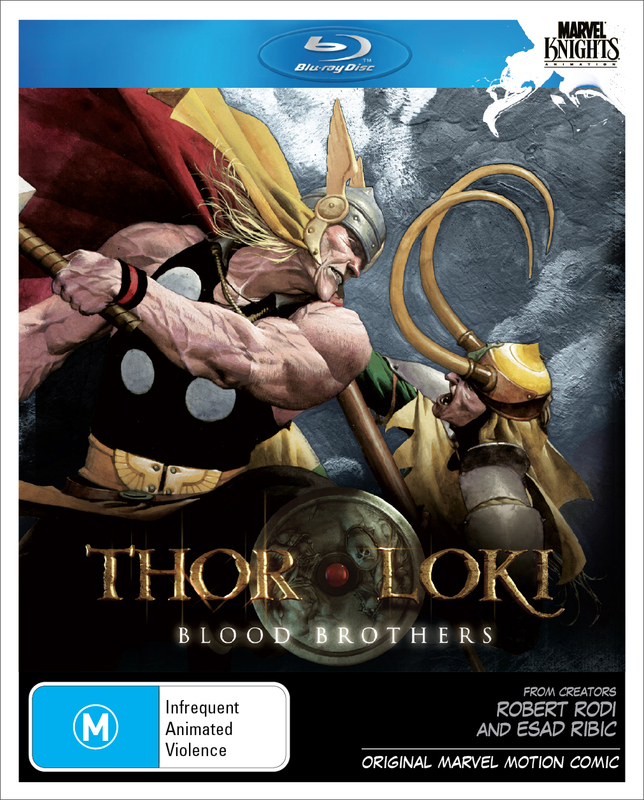 Thor & Loki: Blood Brothers is a solid release and apparently the best of the motion comic releases thus far (I can't verify this because its the first one I've actually seen). For those interested in the the previous releases, Magna Home Entertainment have also released a collected edition of the rest in Marvel Knights: Animated Mini Series Collection 1!